An Oregon company is recalling 5,000 wooden playpens it imported from overseas after receiving multiple reports from customers that the playpens broke and posed potential dangers to children. 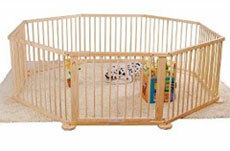 Aosom is recalling its 3-in-1 Baby Wooden Superyard Playpen Combo, its Baby 8 Panel Wooden Playpen Room Divider, its Baby 8-Sided Wooden Playpen 2 Panels and its Baby 8-Sided Wooden Playpen Gate after receiving 69 reports that the playpens had broken, split or cracked in places where the screws were located, exposing the structure's hardware. The broken pieces and instable structure posed potential choking hazards and entrapment hazards if the playpens fall on a child, the company notes. The recalled items were sold from October 2008 to November 2010 on a variety of retail sites, including eBay and Amazon, and feature the company's logo, an "A," on the playpen's gate, officials say. While there are no reports of children being hurt by the playpens, experts want parents to turn in their playpens to prevent injuries. "Consumers should immediately stop using the wooden playpens and contact AOSOM for instructions on how to return the product and receive a full refund," the company notes. For more information on this recall, and to see what other items have been recalled, consumers can visit the U.S. Consumer Product Safety Commission's Web site.